Woweee mummy, I feel just like a movie star! You recently commemorated my handprints and footprints in fine silver encasing them forever. Just like they do on the Hollywood Walk of Fame! It’s lovely to capture precious moments in life, through photographs and videos and you believe it is really important. My Daddy carries a photo around in his wallet and takes me to work in his pocket and loves to show me off, however for Fathers Day you wanted to buy something for him that he would cherish and would be practical. My daddy works in a suit, he’s a London suit. My Daddy can’t carry me to work and I’m sure his colleagues wouldn’t appreciate a terrible two running havoc in the office. *picture THAT Mummy! 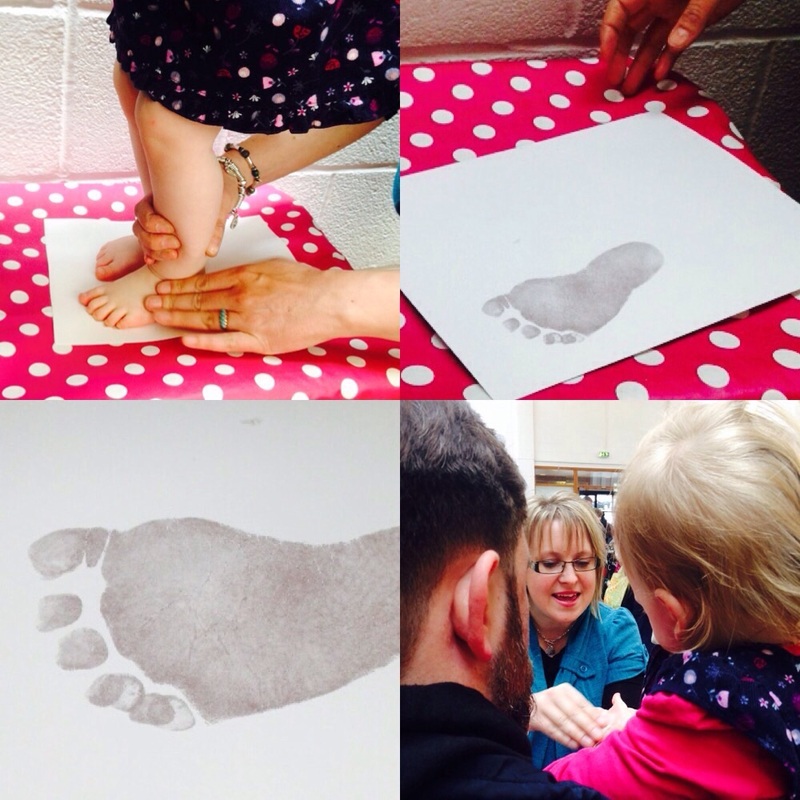 * So with a bit of digging my mummy found a wonderful company online called Smallprint which can take direct contact prints from a child’s hands and feet and reproduce in a wearable form. They are an international company that have local franchises from the US and Australia to the UK! 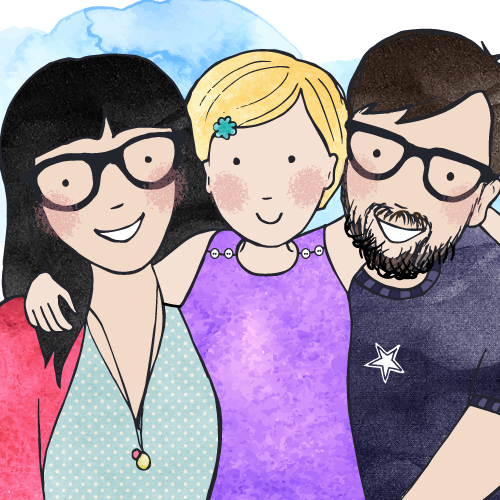 Smallprint was set up by a mum who also wanted to cherish her little ones and make pretty keepsakes. 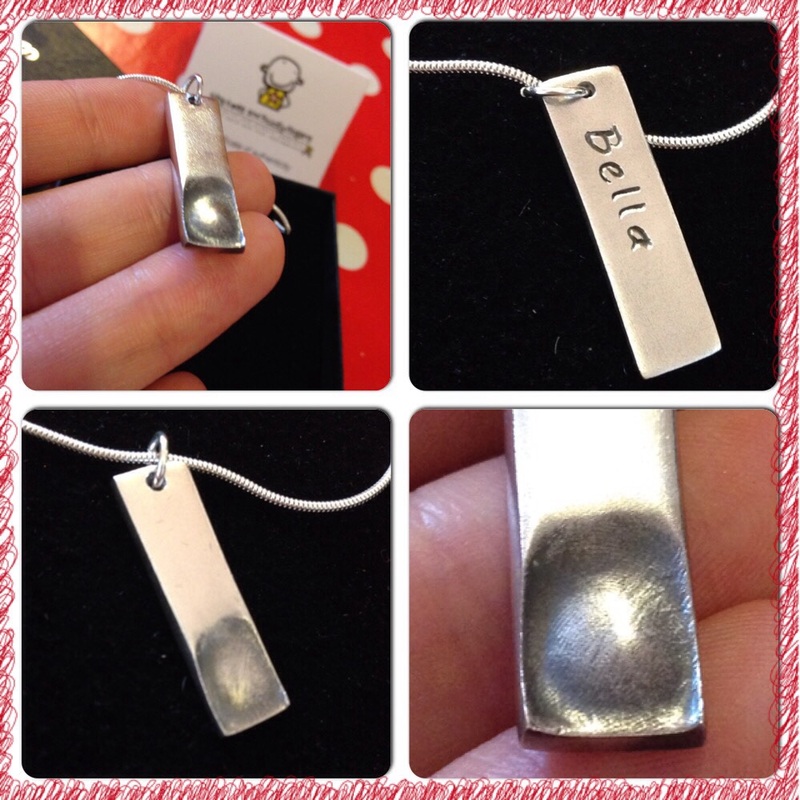 It sounds like a great idea and Smallprint make jewellery for women and men! BINGO – Perfect for Father’s Day! Smallprint’s cufflinks are cool and Daddy can wear me on his sleeves with pride. Smallprint’s jewellery is cast in fine silver and not sterling silver which means it is slightly softer and you are paying for better quality. Sterling silver contains a mixture of other metals and alloys which means it is 92.5% pure, while fine silver is 99.9% pure. 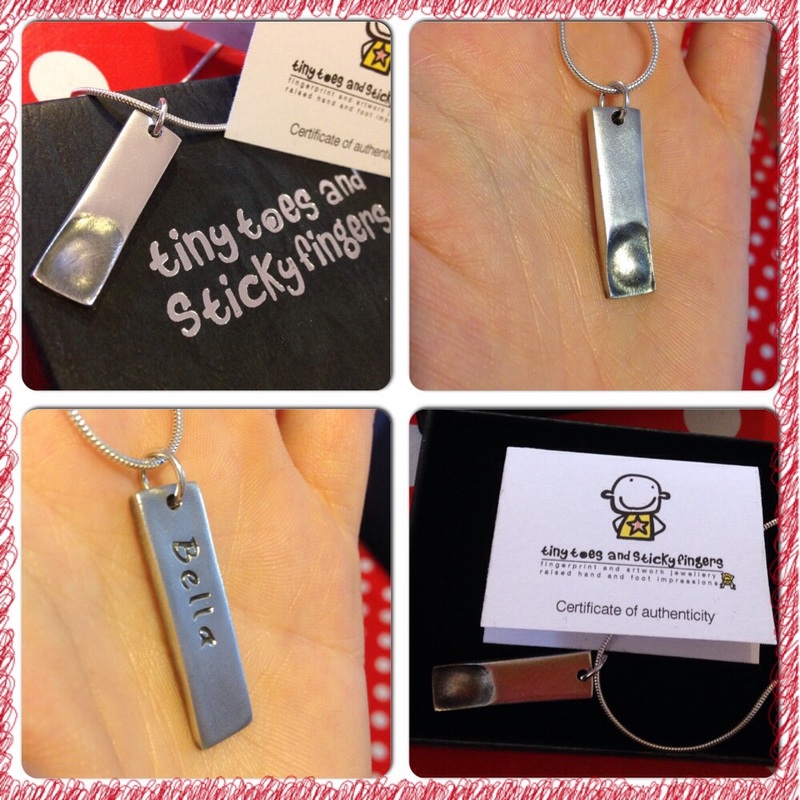 However, all the items that are attached to the imprint jewellery such as chains, clasps, key fobs etc is in sterling silver. 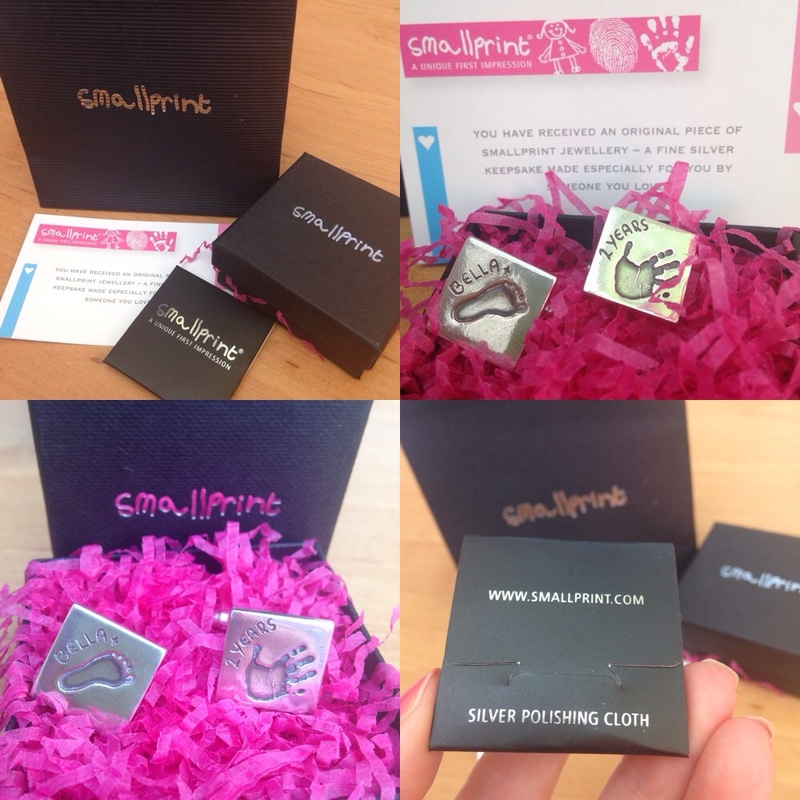 Smallprints jewellery range start from £45 (the cheapest being a fingerprint charm) and include all consultation and materials in order to get the perfect print and the jewellery item and delivery. It may seem expensive but you get what you pay for and is reasonable for a personalised piece of jewellery. It would be perfect for a special occasion. Smallprints turnaround time is usually four weeks. Smallprint jewellers take time to make sure your pieces are finished to perfection. 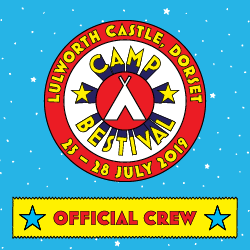 However we found out that if you have special birthday or anniversary and you’ve left it a bit late, let them know and they will see if they can fulfil your order in time…what nice folks! We contacted our local Smallprint franchise based in Newbury and Basingstoke and organised to meet up with a lovely lady called Liane at a local craft fair. Here I had direct contact prints taken of my hands and feet, while we pretended to Daddy that we were making something for Grandma. My mummy found the perfect item for Daddy on their stand which were beautiful cufflinks. Shhhhh don’t tell Daddy! Taking a print was fairly easy as all I had to do was dampen my feet and hands with some solution and stand on special paper. This captured my unique prints. 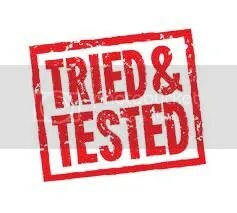 It was good fun and the kind Smallprint representative was very friendly and put my mind at ease. My feet tickled when she rubbed the safe, non-toxic ink-less solution on my skin with a pad. Afterwards she showed us the print to make sure we were happy. As you can see it came out very well 🙂 Prints on paper can be taken from the day a baby is born as you can get a good shape of them. We patiently waited a couple of weeks for our cufflinks and they arrived through the post. We had to grab them before daddy saw them. They came beautifully presented in a little black bag and box and look really smart. They came with a little information note on how to care for the jewellery and a mini silver cleaning cloth which was handy as well. The prints on the cufflinks are clear and you can make out the shapes of my handprint and footprint. We were pleasantly surprised how well they reproduced on such a small piece of jewellery. Shhh. Don’t tell daddy we’re giving then to him for Father’s Day we can’t wait to see his face! We think Daddy is going to be really happy with them. 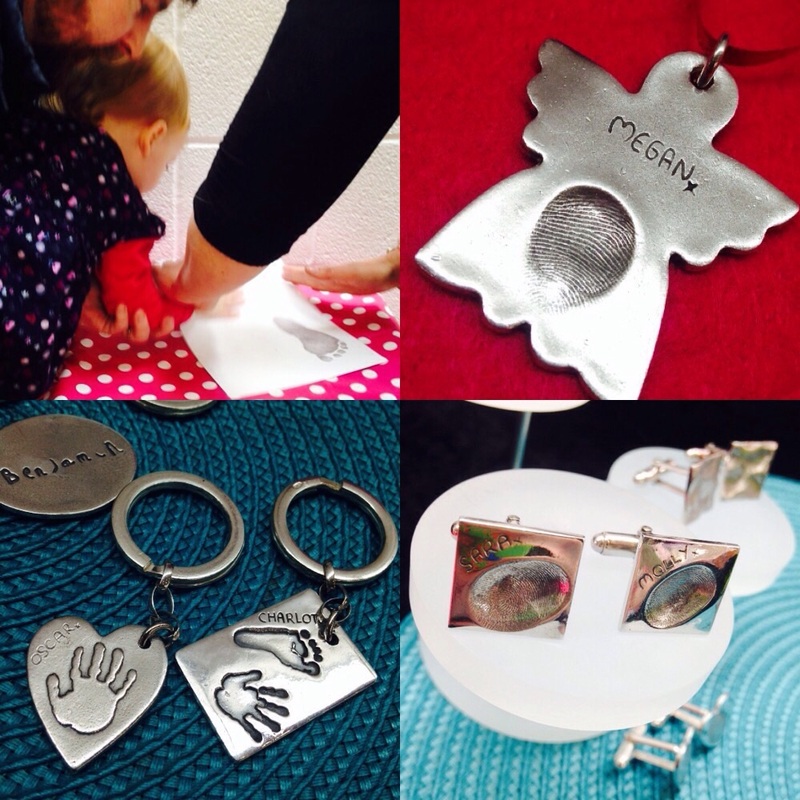 Smallprint also do a wide selection of jewellery and silver items, so if you are looking for an unusual and personalised gift then this would be a fantastic place to start. Disclosure: We received a discount off this item in order to write an honest review. Tiny Toes and Sticky Fingers are a local company based in Basingstoke, Hampshire, they are one of the numerous imprint jewellery makers in the area, but what makes them stand out from their competitors is the unusual range jewellery products they ‘stamp’ on. Sheri, the owner, is a mother of two children and knows how important it is to capture your children growing up. 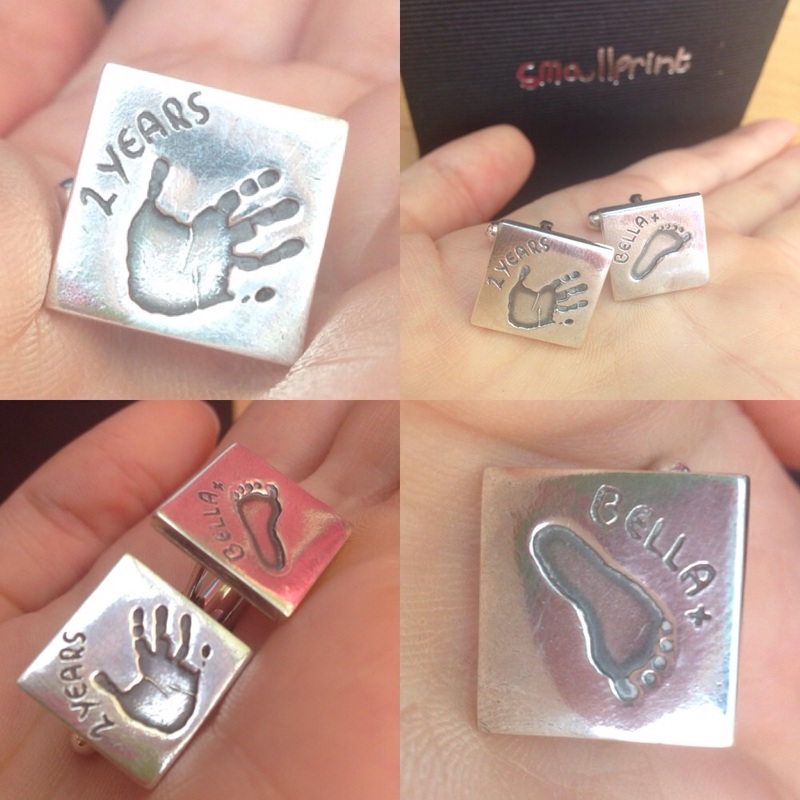 Time goes too fast, so recording their little fingerprints/footprints in silver is a beautiful way to capturing that moment forever. A great heirloom for future generations too. She produces beautiful and individual pieces and is very passionate about her job. Everything is handmade, fired and locally produced and Sheri is a member of the Guild of Keepsake Artisans. She’s not part of a franchise either. Each piece you see on her website is cast, engraved and polished to a very high standard. As its handmade it is also is very tactile and organic looking which adds to the appeal. Any irregularities are part of its charm. We had a nice little chat with Sheri at Ainee’s Bazzar and we were impressed with one design in particular. It’s was a very simple rectangle column pendant called a Ingot Fingerprint Pendant which costs £95.00. My mummy was drawn to it instantly as it was so unusual. She liked the fact that my name could be added to the reverse too. The pendant and chain is made out of 92.5 sterling silver and has a good weight to it. The process to get it ordered was really simple. 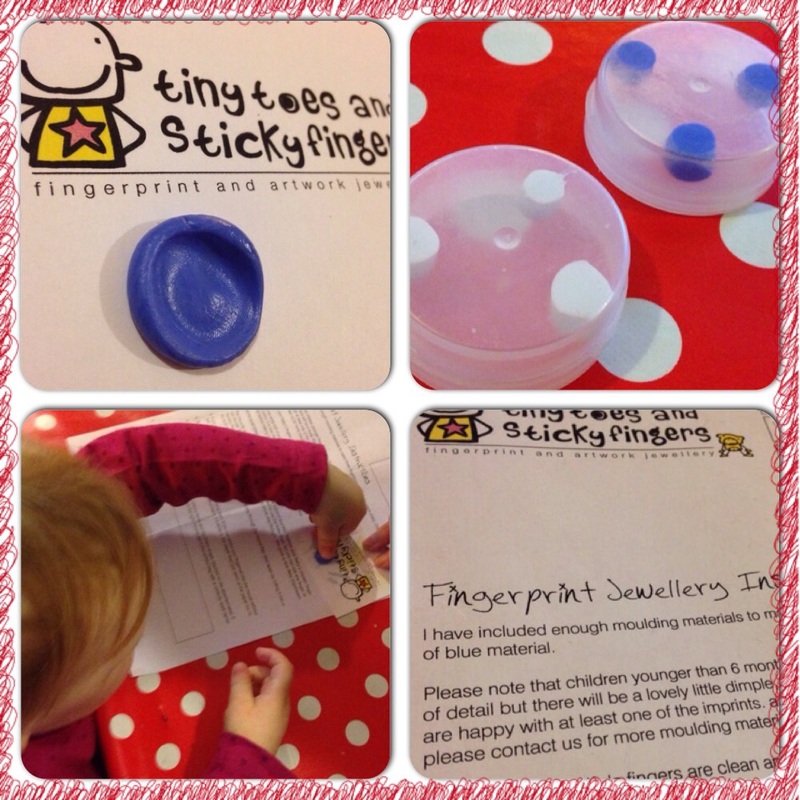 Tiny Toes and Sticky Fingers sent us out a print-taking kit. We were sent the moulding kit to do ourselves in the comfort of our own home a couple of days later. It arrived in a little envelope with 3 clear pots and one side of A4 instructions.We had enough impression putty to take 3 impressions of each fingerprint and the full instructions were very helpful. We had to mixed the blue putty with the white putty between our fingers until it was soft and pliable. Then quickly I had to fingerprint it. I kept squirming and treated it like play dough…so once I had fingerprinted it, I wanted to squash it! DOH! Two attempts later we had a print. Thankfully we didn’t run out of moulding putty! Phew! We couldn’t really see how good it was, but sent it back in the envelope to Tiny Toes and Sticky Fingers once it had hardened (took about 10 minutes). We had to sign a form to say we were happy to proceed. Sheri used that little mould to create my mummy’s unique piece of jewellery. Depending how quick you are with getting the moulds back the whole process can take between 14 – 28 days. We eagerly waited the finished article. It came through the letterbox a couple of weeks later and was presented in a beautiful gift bag and box. My mummy opened the box and was thrilled with it, however daddy said the imprint could have been clearer, but that’s as much to do with my fighting fingers and my mummy rolling and mixing the putty numerous times and not Tiny Toes and Sticky Fingers fault. It was enough to show my little finger print in the silver and that was enough for my mummy. Daddy thought it looked like a dirty smudge on the pendant but my mummy was happy and as she has to wear it, that’s all that mattered. Even with few lines or undefined ones you still get a lovely finger shaped dimple imprint and I was fascinated with it and kept wanting to place my thumb in the imprint to compare. Tiny Toes and Sticky Fingers does say on their website that in most cases the fingerprint is very clear but it does depend on age and the depth of lines on the finger. Tiny babies will have less defined prints as the lines will not have developed. It’s lovely that my mummy can wear a momentum of me around her neck and that it is abstract enough that you can’t instantly recognise what it is….a real selling feature for her. My mummy is now thinking of ordering more when I grow-up for Grandma and Grandpa. 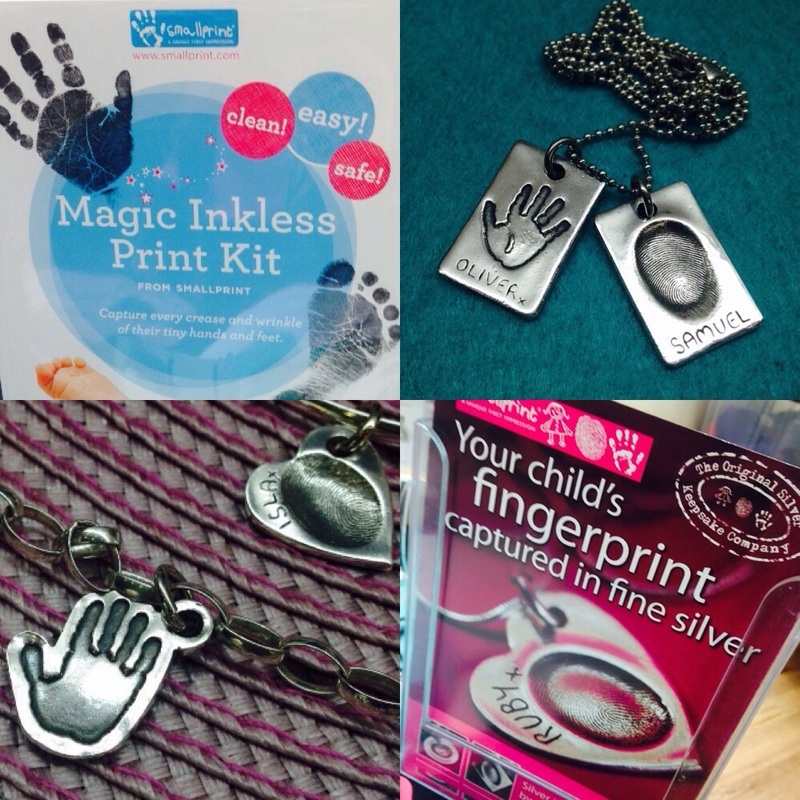 They also do Paw Prints, Raise Impressions, Nursery Prints and a whole host of silver jewellery ranging from keyrings to charms. If you’re looking for something standard and flawless then we would recommend going to HS Samuel, but it you are looking for something handcrafted, quirky and unusual then this is the place for you! The price is not cheap, but the memories attached to the experience of making the moulds and the end jewellery creation makes up for it. Everytime my mummy looks down at it she will remember the day we help make this piece of unique jewellery…and that’s priceless. You can find Tiny Toes and Sticky Fingers on Facebook. 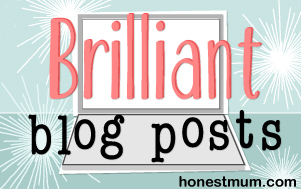 We hope you like our pendant and review!